Trudy Good professes that her ‘works are never narratives, merely moments.’ I’m going to suggest that there’s a paradox at work in this statement. But it’s an intentional and productive one; precisely the sort of contradiction that good art often reveals and explores. Her style and subject matter accordingly make for an interesting artistic proposition vis culture, technology, and aesthetics. ‘Ballroom Series, I’ depicts a finely dressed couple dancing—presumably the same couple shown in ‘Ballroom Series, II’ and ‘Ballroom Series, III’. Is this only an assumption? It suggests that each moment or artwork depends upon the series—i.e., the narrative—and so the catalogue reads: ‘Ballroom Series, I’, ‘II’, and ‘III’. The plainness of each title—each of which is more like a label—then accentuates each work’s being merely a moment. For each may be part of a narrative and thus moments if not narratives in themselves. So why merely moments and not just moments? For despite their merely-ness; each is highly accomplished and lays claim to its own autonomy. But precisely because of this merely-ness; each work lays no claim to any of the others. For none of the artworks depicts a stumble becoming a trip before a fall and therefore a narrative. It’s a very elegant formulation of a central problem in aesthetics: the relation of the autonomous artwork to its wider heteronomous forces. The relation of the autonomous artwork to its historical milieu. The relation of ‘Ballroom Series, II’ to ‘Ballroom Series, I’ and ‘Ballroom Series, III’. If this is an assumption—a narrative composed of moments yet with no narrative as such; then it is a necessary assumption but also a contradiction. Good’s ‘Ballroom Series’ explores this contradiction through its form (the opening quote and each artwork’s title) and the relation of the artwork to its milieu through its content (its subject matter). Each moment could even be described as a snapshot or frame of an imaginary motion picture—the real of the reel. Good’s memories of watching ‘Come Dancing’ certainly suggest the influence of the televisual and photographic modes of aesthetics. Interestingly, the monochrome of the charcoal is intended to pay homage to ‘the haunting quality of antique photographs.’ In this way, the subject matter, style, and practice interpenetrate one another to form the artworks and reflect upon the influences of technology of contemporary aesthetic practices. Eadweard Muybridge, A Couple Waltzing. 1893. This criticism is a little unfair of course: Muybridge’s motivation is technical; Good’s artistic. It is noticeable however, that the ‘edges’ of the dancers in phénakisticope are ‘lines’ rather than ‘blurs’ as in the latter. David Hockney, whose work has explored, more than any living artist’s today, the interrelations between art, culture, society, technology, and photography, writes in his Secret Knowledge (2001) about the influences of the photography on the ‘lines’ and ‘edges’ of painting and drawing. Comparing Cézanne’s Cinq Baigneuses (1887) with Bougeureau’s academic style in La Vague (1896), Hockney argued that the style of the former has no doubt triumphed over that of the latter. ‘Bougeureau’s was finally dismissed as something silly.’ ‘But today,’ says Hockney, ‘what way of seeing and representing has really triumphed?’ It is, so he says, ‘[t]he photographic image! The Bouguereau painting…Look how the edges of the nymph have been softened to blend in with the sea. They are not crisp, sharp lines.’ Good’s artworks are influenced by precisely this aesthetic rather than that of Cinq Baigneuses. 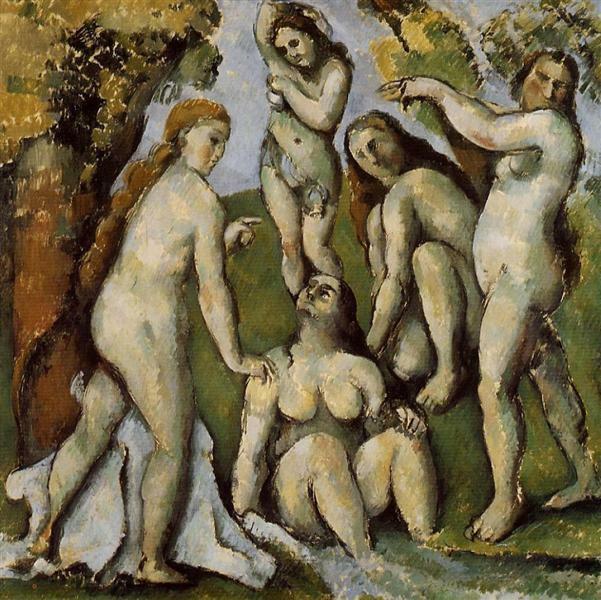 Paul Cézanne, Cinq Baigneuses. 1887. William Bougeureau, La Vague. 1896. In her most recent works, Good has used a camera to take photographs of models to work from in her studio. This is no longer a ‘secret knowledge’ pertaining to the camera obscura (a pin-hole image rendered by sunlight in a dark room) but rather a simple camera that allows her ‘to use really strong directional light which creates mood and drama.’ Again, the representation of the ‘dramatic’ has been secretly influenced by technology just as the ‘time passed’ has been influenced through the monochrome of the ‘black and white’ to produce the aura of melancholy. Good has written that in art, ‘[t]he sheer beauty of a single line, the way that light plays on her hair, the feelings conveyed by her body language in a single unguarded moment—these are the things that inspire me time and time again. Sometimes a sense of peace, sometimes melancholy, the million different emotions that make up human nature, every one interests and inspires me.’ In this analysis, it is not only the emotions that effect an affect like melancholy, but the technologies of the visual in the camera that in turn complicate what we think of as human experience. The ‘sheer beauty of a single line’ is not only ‘sheer beauty’ but an entire history intersecting the figure of the artist, her memory, her society, culture, technology, camera, and aesthetic. ‘Ballroom Series’ therefore makes for a unique and nostalgic moment in which the ‘moment’ itself is considered and its conditional technologies surveyed.